Months in the making, this itsy bitsy nook in our room is finally nearing completion- save a little wee one curled up inside of it! After co-sleeping with our now toddler, who is finally in her own bed, we wanted some more options this time around. We added a Dock-A-Tot to our list of must-haves, as well as the Origami Mini-Crib that slides right up alongside our own bed. One of the reasons we went with the mini-crib as opposed to a pack-n-play style crib was the durability. When we tested a pack-n-play, C. rattled it heartily, and we concluded that baby needed a safer sleeping space! Space has also been a bit tight in this home, so we added a large Pehr Design bin to the windowseat. This holds extra bed linens, swaddles, and blankets. 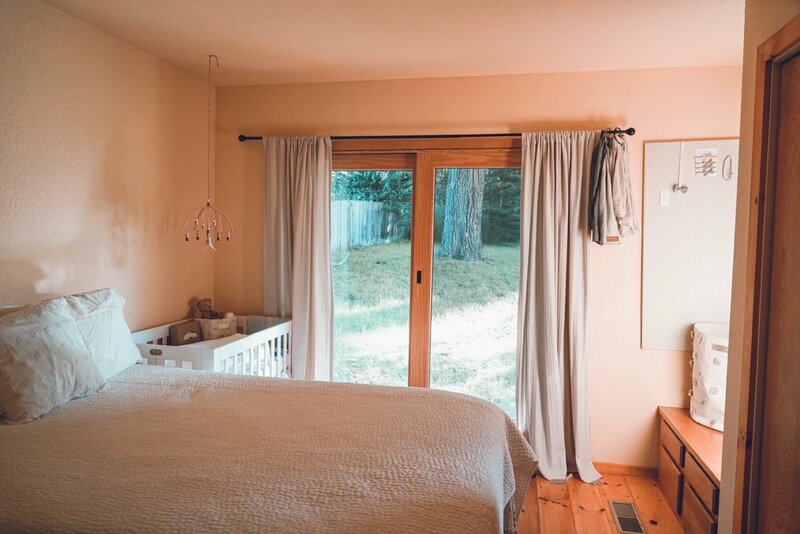 The curtain rod doubles as a placeholder for our favorite My Wild Bird slings. Having quick access to those will be so important! We have loved the idea that baby spends nine months tucked to momma, just as she spent nine months growing in momma. The large canvas board was a DIY project way back before C. was born. It is a store-bought canvas similar to this one, covered with a light moss linen. Simply staple fabric to the wood frame of the canvas, and vio la! Done! Because C. likes to get into mischief, all of the items that are hanging have a sewn ribbon instead of a tack. Nothing good can come of toddlers with access to tacks! The sewn ribbons give me easy access to baby sister's bows as well. The rustic, warm tones of this home weren't something I had worked with before in our living space. We had always rented spaces with light colored walls and modern accents. It was fun to find ways to keep the nursery nook modern, but still cohesive with the house. The mini nature mobile by Bella Bloom Kids did just that. Each mobile is custom made, so each color could be picked out! White to match the crib, and wood tones for the home. The rest of the space came together so easily after the large peices had been purchased. My grandmother's vintage scottish blanket drapes over the crib side for now, and another Petite Pehr bin stores itsy bitsy newborn diapers. Having those in close proximity to the crib is a must!